Commercial premises, of two phases: the former Financial Times headquarters by Sir Albert Richardson (opened 1959), converted and altered to form the Obayashi headquarters by Michael Hopkins and Partners (started 1988; opened 1992); Ove Arup and Partners, consulting engineers. Both elements are of considerable interest. The 1950s parts of the building are faced in red Hollington sandstone, from Staffordshire, and pale red bricks with bronze windows, beneath a weathered copper roof. This colour was a deliberate reference to the Financial Times’ pink pages. The newer elements of Bracken House comprise a reinforced concrete frame with external windows of cast gunmetal and bronze, above a sandstone plinth. The principal internal materials are of finely cast concrete, zinc-coated steel, and glass. The rectangular site comprises a northern and southern range, retaining Richardson and Houfe’s 1950s structure. Between, on the site of the former printing works, stands a large elliptical central section, planned around an atrium, with four lifts, stairs and landings beneath the glazed roof; on each side, on seven floors, is an open office floor area. The entrance is now from the east, on Friday Street. Bracken House is a prominent City building to the SE of St Paul’s. Two of the sides (N,S) retain Richardson’s masonry and brick elevations; the others consist of richly glazed steel and glass High Tech insertions. The N elevation to Cannon Street is of ten bays, with canted angles to each corner; that to the S is of seven bays, with rounded turrets. Seven stories, above two service basements. Richardson and Houfe’s elevational treatment comprises a plain giant order in brick, with sandstone plinth and banding at first and second floor levels, rising up to a cornice with a recessed attic above. Elegant detailing abounds: the prominent astronomical clock in gilt and enamel by Philip Bentham (decorated with Winston Churchill’s face – a tribute to Bracken’s political mentor), the oak leaf enrichment to the main entrance, and the free-standing bronze columns to the ground floor bay windows. The Hopkins element is complementary, while very different in feel. The elevations respect the plinth, cornice and roof lines of the earlier parts, while adopting a High Tech treatment with abundant glazing (necessary for the deep floor-plates within). This glazing consists of rectangular bay windows with angled returns, linked by continuous tie-rods. The outer walls are load-bearing, and faced in cast gunmetal and bronze; external columns run the full height of the building and are supported on metal base brackets which rise up from tall sandstone piers. Few areas of the Richardson phase’s interior survive, having mainly been converted to open-plan office use: the original entrance hall to the north side is the best-preserved and most interesting, with a decorated door surround, giant pilasters and a mezzanine level landing. The prestigious upper floor along the north side retains marble window surrounds, but is otherwise much altered too. The new central section contains a double-height reception area, beyond which is the imposing atrium. This features a central bank of partly-glazed lifts with exposed cabling, accessed by a daring bridge of glass block set in concrete. The atrium is top lit by a similar grid of glass block. The floor slabs are carried on reinforced concrete columns, and supported in the central section by radial beams. Services are located within the floor void, resulting in minimal visual intrusion. Within the newer spaces, the detailing and execution is of a consistently high standard in the shared areas: the concrete contains sparkling Lee Moor sand, and is very carefully finished, while the use of glass bricks to the floors of the upper levels compounds the intricate luminosity of the spaces. The service areas are not of special interest. Bracken House was built as the headquarters and printing works for the Financial Times (established 1888). It takes its name from Brendan Bracken (1901-58, created Viscount Bracken in 1952), who served in Churchill’s wartime government as Minister of Information before returning to publishing: he merged the Financial Times with the Financial News in 1945, thereby creating England’s largest business newspaper. New premises were built in 1955-58 on a prominent blitzed site SE of St Paul’s Cathedral, to the designs of Sir Albert Richardson PRA (1888-1964): Richardson was a leading mid-C20 English architect, who worked in partnership with Eric Houfe from 1945, and who is remembered for his writings as well as for his creative fusion of tradition and modernity. 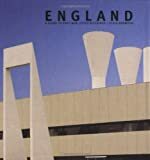 Richardson began his designs in 1952; Houfe showed a drawing of the building at the 1954 Royal Academy, in which year planning permission was granted by the LCC. The north range contained editorial offices; the centre contained the printing works; the south range was a self-contained office building capable of being sub-let. Opened in 1959, this was one of the last City buildings to be designed in a classical manner, albeit in an idiosyncratic style which owed much to Richardson’s familiarity with earlier C20 French architecture, as well as with Italian Baroque (Guarini’s Palazzo Carignano (begun 1678-99), in Turin was a particular inspiration). In keeping with other leading newspapers in the 1980s, the FT quit its historic inner city premises for production elsewhere in London. Newspaper production ceased at Bracken House in 1988, and a competition was held for a new building on the site: this was won by Michael Hopkins (b.1935) and Partners. Hopkins turned to the pioneering iron and glass office building by Peter Ellis, Oriel Chambers, Liverpool (1864) for inspiration: the key motif of the boxed-out oriel windows, with slender iron columns, is strongly sensed. 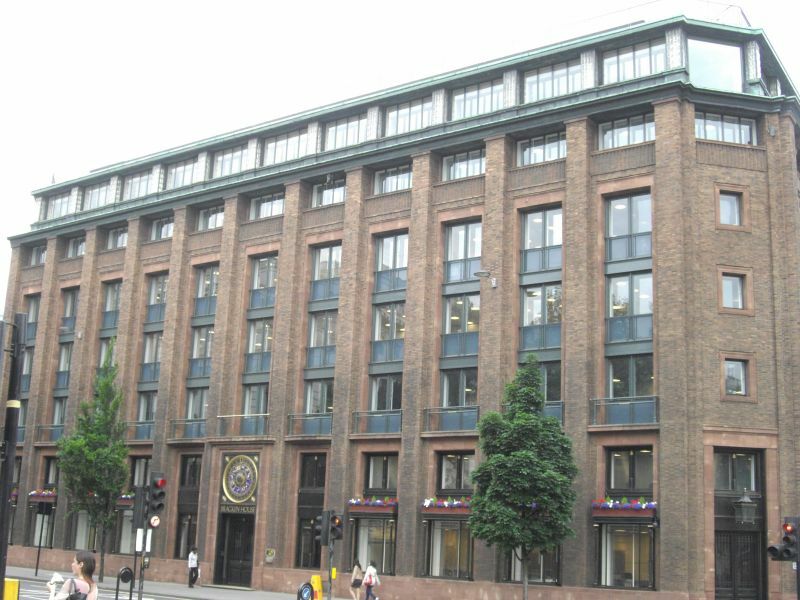 Bracken House was the first post-war building to be listed, by the Department of the Environment, in August 1987, following a campaign to save the building from demolition. Partial retention of the Richardson building had already been considered as an option. This led to a re-design of the winning scheme, with Richardson’s outer north, east and south ranges being retained, while the central printing hall was replaced with a new structure containing generous office and trading floors. The building was redeveloped by the Japanese Obayashi Corporation (which acquired the freehold from Pearson’s in 1987) as prestigious quarters for the Industrial Bank of Japan, and occupied in March 1992. * Detail and finish: both the Richardson and Hopkins phases are marked by an exceptionally high standard of finish, albeit in contrasting idioms. This ranges from the symbolic clock and oak-leaf decoration to the Richardson parts, to the sophisticated structural expressions of the Hopkins elements.